Elite Whey amino acid profile (per 100g of protein). Summary: Dymatize's Elite Whey is the cost-effective version of ON Gold Standard Whey. Dymatize's whey is equally as good and it comes at a cheaper price, the only trade-off being that it doesn't taste as good. ON Gold Standard Whey. Costs more and tastes better. Dymatize Elite Whey. Costs less and tastes worse. Basically, both protein powders are as exceptionally good as each other, but you either decide to pay for the taste or you don't. What did I mean by that "poor-man's" phrase being almost perfect? Well, the "poor-man's" part makes it sound as though you're getting an inferior whey protein by choosing Elite Whey over Gold Standard Whey, but you're not. Instead, I'd prefer to say that "Elite Whey is the cost-effective version of Gold Standard Whey". Not as sleek a phrase I know, but it's more friendly. Apologies in advance for repeatedly comparing Elite Whey and On Gold Standard Whey from here on out. I know there are roughly 5 million other wheys out there, but the fact that I'm just comparing these two should be a testament to how stand-out impressive they are compared to the rest. Don't be deceived by the lame design of the label, because Elite Whey is a top-quality whey protein. You couldn't ask for more from a whey blend. Elite Whey is high protein and low calorie – basically it's low in everything you don't want and high in everything you do. Along with On Gold Standard Whey, it's one of the best quality whey proteins on the market. On a more scientific level, Elite Whey contains the 3 classes of whey protein; whey protein concentrate, whey protein isolate and whey protein hydrolysate. The fact that this powder contains hydrolysed whey makes it even more awesome, as this class of whey protein is more quickly absorbed by your body than any other type of whey, which is exactly what you're after post-workout. At first I wasn't a fan of the taste. It has a bitter kick to it and it's blatantly not sweet and delicious like IntraPro or Pharma Whey. However, Elite Whey grew on me. The problem is I don't know if it's because I actively wanted to like the taste. The quality of the whey powder is just as excellent as ON's Gold Standard Whey – but it doesn't taste as excellent. It's much cheaper though, so maybe the taste of all those saved pennies in each serving makes that it little bit yummier. The thought of all that nutritional goodness helps too. Savings aside, the best way to describe the taste of Elite Whey is "fine". You won't love it, but more importantly you won't hate it either. From a taste perspective, if ON Gold Standard Whey is Kellogg's Cornflakes + sugar, Dymatize Elite Whey is Tesco Value Cornflakes without the sugar. 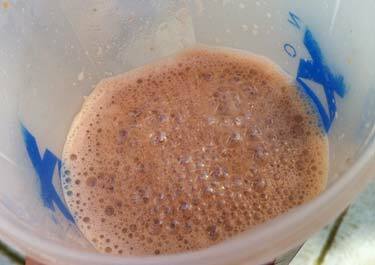 Elite Whey Mixability: 50g of powder + 400ml of water. Elite Whey has the same sandy consistency of Gold Standard Whey, and if you've read my review of ON's whey (how can you not have by now?) you'll know how much I love it. Unsurprisingly, Elite Whey mixes equally as awesomely. 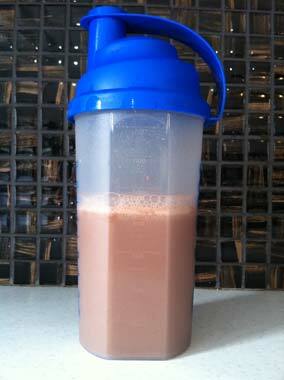 If you sneezed whilst holding your shaker just after adding the powder to the water you'd end up with the perfect shake. This sandy powder mixes so effortlessly you'll wonder why other "powdery" powders can't be the same. The only reason why Elite Whey doesn't have an even better score for mixability is because it there is a minimal amount of frothing. And when I say minimal, I mean minimal. In fact you'll probably laugh at me for even mentioning it when you see it for yourself. Tiny amount of froth, but it's more of a good froth than a bad one anyway.